The picture you see below of a precious tiny baby girl that lost her life in Kermit Gosnell’s “House of Horrors” was published this morning. One of those babies is pictured below. I'd tell you his name, but he didn't live long enough to have one - we know him only as "Baby Boy B." 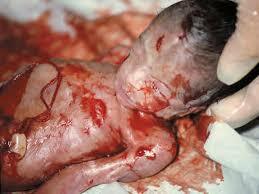 Buried three babies killed by abortion. From the Desk of Fr. Frank Pavone, M.E.V. What a ceremony we had yesterday in Hanceville, AL, as we buried three babies killed by abortion. Hardly any experience can bring home to people more directly and explicitly that abortion is not an abstract issue, but rather the biggest holocaust of all time, happening right in our midst. In this email you'll see my column for this week, with reflections on the event. Please spread this to others, so that the power of this funeral can impact as many people as possible! Stay tuned to our website, www.priestsforlife.org, where we will soon post video and audio of the event. I will be at EWTN taping all this week, and will also be on the Live Show Wednesday night. One of the things I will speak about is my ongoing call for people to mobilize for the 40 Days for Life campaign. We have great momentum now for an essential aspect of ending abortion: the People of God must take to the streets and gather around the places where the killing is occurring. By doing so continuously, in prayer and penance, lives will be saved and mills will be closed. Please let me know if you are taking part! Hear us on EWTN radio on Catholic Connection with Teresa Tomeo. I am her guest every Wednesday at 9:30am ET and Janet Morana is her guest every Friday at 9:10am ET. For radio station information and to listen to the live show on the internet, go to www.avemariaradio.net. Defending Life: Watch on EWTN every Friday at 10pm ET and Saturday at 2:30am ET. Listen on EWTN radio every Friday at 1am ET, Saturday at 6:30pm ET and Sunday at 5am ET. Aug 8-9: A Powerful Witness. A piece of history comes alive as Martin Luther King's sister-in-law reflects on the civil rights movement and the rights of children in the womb. Aug 2-3: Why the Bible Says No to Abortion part 3. In a conference address, Fr. Frank explores the Biblical passages and principles that argue for the right to life. Aug 9-10: The Call. In a chapel talk at the Family Research Council Fr. Frank shares an inspiring look at God’s call to Pro-life activism. Please tune in and spread the word! In fact, you can help us – and your whole parish -- by asking your pastor to place in the parish bulletin an announcement about our TV shows. Thanks in advance! On the afternoon of Sunday, July, 27, 2008, close to five hundred of the faithful filled the tremendous Shrine of the Most Blessed Sacrament that Mother Angelica built in Hanceville, Alabama. They were gathered for the funeral of three children – Karen Esther, Enoch, and Rebekah. The three children were all in the same small white casket. All had been killed just weeks earlier by abortion, and discarded in the trash outside of an abortion mill in Livonia, Michigan. Dr. Monica Miller, Director of Citizens for a Pro-life Society, transported the children to Alabama. I conducted the funeral ceremony. Mother Angelica’s community of sisters sang. The People of Life prayed, worshipped, mourned, and rejoiced in the hope of resurrection. As they honored the dead, they recommitted themselves to protect the living. I have done funerals like this in various parts of the country. It was especially important, however, that this funeral took place at Mother Angelica’s Shrine. I remember when she first told me, years ago, that at the heart of her vision for that Shrine was the unborn child. This was to be a place dedicated to the Divine Child, and a place where children in the womb – so easily forgotten and discarded in this culture of death – would be remembered and celebrated. That’s what we did on July 27. I reminded the congregation of the funeral that Cardinal Joseph Bernardin of Chicago conducted back in 1988, when he buried two thousand aborted babies. When asked about the legal implications of the burial, he responded that such concerns paled to insignificance in comparison to the evil of taking innocent human life. He said he was doing a corporal work of mercy – to bury the dead. That’s what the People of Life do. They protect the living, and they bury the dead. They are not ashamed or afraid to honor in public those who are dishonored in secret by the hidden violence of abortion. By gathering in large numbers to bury aborted children, and by letting as many people as possible know about it, they make up in some small way for the callous disregard in which these children are held by many in our society. That’s why the 16,500 babies found in a large container in the Los Angeles area in the mid-1980’s had to wait for three years before they were buried, as abortion supporters launched a legal battle to block the burial. They did not want society to acknowledge in any way that there was any humanity there to be honored. Just throw them away – and the more secret, swift, and private the better. So the abortion advocates believe. But the Church believes different, and as we believe, so we worship. The congregation – including children holding their parents’ hands – filed by the casket, which was open, and viewed the remains of these babies. There were tears of sorrow, but full of hope. Each person left that church more committed than ever to bring the killing to an end.